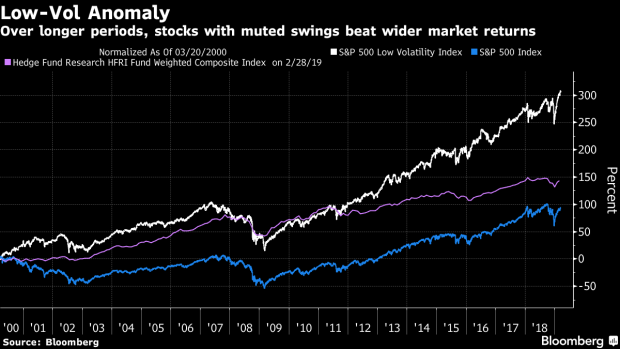 (Bloomberg) -- Quants are flocking to boring stocks as the strategy flips from high-flyer to laggard -- while hedge funds that are snubbing placid securities outperform. Managers that follow quantitative strategies are loading up on low-volatility shares, a shift from their typical allocation over the past five years, according to Sanford C. Bernstein. Those wagers are underperforming the broader market and potentially hitting returns. The MSCI USA Minimum Volatility Index is trailing the broad market benchmark by nearly 3 percentage points since the start of January, among the worst showings for any factor tracked by Bernstein. In a reversal from last year, hedge funds that are avoiding placid securities are outperforming quants. But for managers who buy and dump stocks systematically based on common attributes, vindication could yet come if the behavioral biases that keep investors away from boring equities hold true. And if the new-year rally sputters out, a heyday for low-vol stocks -- sought by quants and a broader group of investors this year -- could arrive even sooner. Min-vol strategies are part of the DNA for quants like Acadian Asset Management that have popularized the factor. The low-vol anomaly, as it is known, arises because portfolio managers tend to favor racier shares, causing steadier names to be undervalued. But even for quants, increasing exposure to low-vol can be costly. While the strategy can provide a cushion when markets tank, it will typically lag a rally. Quant funds are down around 1 percent this year, compared with a more than 5 percent gain for hedge funds, according to a recent Bernstein note. Still, last year was the perfect illustration of how low-vol can bail quants out. The factor bested momentum, growth, quality, value and cap-weighted benchmarks in the fourth quarter. Indeed, since 2000, the factor has beat the S&P 500 by a whopping 210 percentage points. “Over a full cycle, the downside protection of low-volatility stocks has led to better risk-adjusted returns for low-volatility stocks, and this is exactly what we want to capitalize on,” said Robeco’s Jan Sytze Mosselaar, whose Robeco QI Global Conservative Equities fund is up 11 percent over the past year, beating 89 percent of peers. A broader pool of investors are embracing low-volatility shares. The $24 billion iShares Edge MSCI Min Vol USA ETF is poised for eleven months of non-stop inflows. The dovish stance of central banks is a potential tailwind for a strategy that’s reliant on bond proxies like utilities and high-dividend payers, according to Andrzej Pioch, a money manager at Legal & General Investment Management. The firm recently increased its position in low-vol and quality stocks in its multi-factor funds. Of course, if equities go on a tear -- something banks like JPMorgan Chase & Co. anticipate -- the strategy is likely to continue to underperform. Another reason to be cautious is the risk of over-crowding and the rise in valuations, according to Man Numeric’s Rajamony. Still, quants remain excited by calm equities despite this year’s lag -- perhaps a bet that the rally is on borrowed time. “Boy, do the sleepier, more boring companies tend to do great when the market takes a dip,” said Ryan Taliaferro, director of equity strategies at Boston-based Acadian.